I soon found out that there were a couple of corollaries. The first is that if you don’t know, you interview and write about someone who does know. A second item quite easy in this 21st century is that if you don’t know you can find out on the net. That was not so easy back then. My friend Mark Budgen (of whom this blog is about) was one of the best free-lance writers I ever met who was justly famous for going to incredible lengths of tireless research before he put pen to paper. Now you can always check first with Wikipedia. In parapsychology and spiritual practice, an aura is a field of subtle, luminous radiation surrounding a person or object like the halo or aureola in religious art. The depiction of such an aura often connotes a person of particular power or holiness. It is said that all objects and all living things manifest such an aura. Often it is held to be perceptible, whether spontaneously or with practice: such perception is at times linked with the third eye of Indian spirituality. Various writers associate various personality traits with the colors of different layers of the aura. It has also been described as a map of the thoughts and feelings surrounding a person. Skeptics such as Robert Todd Carroll contend that people may perceive auras because of effects within the brain: synaesthesia, epilepsy, migraines, or the influence of psychedelic drugs such as LSD. Other causes may include disorders within the visual system provoking optical effects. Eye fatigue can also produce an aura, sometimes referred to as eye burn. For most of my life the only aura I ever experienced was the aura of Kodak b+w Infrared Film. Exposures with this film had a curious glow around things but particularly around human figures. This was because the film didn't have the anti-halation layer (found in all film except for the now, alas, discontinued Kodak Infrared Film), so the light bounces around within film backing creating that aura. In 1966 I went to a show of Jefferson Airplane at the Fillmore West in San Francisco. Of the show I remember little. What I do have in my memory is a sharp image of a young woman sitting on a corner staring at a little glass containing crème de menthe. She must have been under the influence of LSD and she was seeing (perhaps in my imagination) a perfect green beyond greenness - a green approaching a Platonic essence of a perfect form of green. I think I may have been close to seeing that kind of green (very sober) when Rosemary would descend from Mexico City to Orizaba, Veracruz on our way to visit my mother who lived in the port of Veracruz. Tropical Orizaba oozed green. While still living in Mexico my friends always made fun of my straightness and tried (unsuccessfully to get me drunk or high). The latter came with an experiment where I was given some peyote to consume. I threw it up immediately without any ill effects or visions of any kind. In Vancouver my friend Maurice Depás made me put some of his best hash into my pipe while we were sunning ourselves on Wreck Beach. My pipe, in which I usually smoked the best pipe tobacco was ruined and all I experienced was an inability to move and extreme stuttering. That was it as far as pot was concerned. My only other drug experience happened at Gary Taylor’s Rock Room, where chubby young woman with a smile on her face said to me, “Are you Alex Waterhouse-Hayward?” I nodded yes. She told me to open my hand and poured a white powder. “Sniff it,” she ordered. I did not think I had a choice so I did. She came back later to ask me about my experience. “It was like going up the stairs of the New York City subway on a hot summer day. The cool air rushed as I went up.” Apparently this was the wrong answer and I never saw her again. In short I have seen very well, very sharply all of my life with one long and painful exception. Between 1980 and 2002 I suffered debilitating migraines. They came with lights similar to the little flying lights in Close Encounters of the Third Kind. During the painful episodes my vision was blurry. The only drug that helped was a powerful prescription medicine called Gravegol. Thirty minutes after taking it I could survive a thrashing from the worst mother-in-law-from-hell with aplomb. Curiously the only other person in my circle of friends who had migraines was my friend Mark Budgen. As soon as I was 60 my migraines petered out. I sometimes get pre-migraines but with no lights. Budgen still gets them. Some months ago he woke up with a terrible one, so painful he went to the hospital. To make the above story short,, Budgen was diagnosed to have three brain tumours. All but the third were removed and after a two-week radiation treatment in Kelowna, Budgen is alive, all here but aware that his months might be counted with the fingers of one hand. Before the radiation treatment Budgen described to our mutual friend Ian Bateson (and me) during a separate but same-day drive to the hospital in Oliver, a strange and terrible aura that he saw behind us on the hospital wall and around our body. This aura which he called a hallucination came with terrible visions of his visiting brother from England dying (he did not) on his trip back to home. Our friend Bateson, who is a most capable artist (beyond the fact that he is a trained designer and a very good editorial illustrator) has been experimenting with his iPad and a program called Procreate. Bateson and I decided to visit Budgen last Monday, August 24th. We drove in our Malibu to Oliver on a day that was most unusual. Such was the smoke and haze from the forest fires in Washington State, that beyond Hope little was visible in what was golden haze (it was sunny above it). When we approached Kelowna the lake was only visible for a few yards. Nothing on the other side was visible. We had a little picnic on a sandy beach in Penticton in which we could have easily, beyond the sand, have been in the middle of a foggy ocean. Paradoxically the “aura” we experienced was not matched by Budgen’s. He saw perfectly with his glasses and asked Bateson to put his favourite podcasts by (Melvyn Bragg, Baron Bragg a British broadcaster, author and parliamentarian.) on the list of favourites in his iPad. 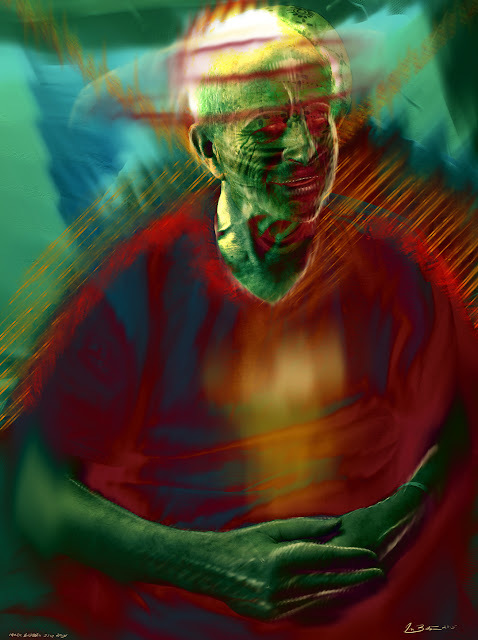 When we first visited Budgen he could not have used his iPad or even read anything as it was all clouded by the visions of his aura. Bateson presented Budgen with his portrait, a 5x7 inch lovely interpretation of an aura (see above). He liked it (did not say anything) but instructed Bateson to put it on his bedside table. Before we left he moved it beside him on his bed. Bateson and I talked at length driving back on how the man we knew from our past was almost exactly the man we had visited for three hours. He was precise, concise and oozing with intelligence. As always it was contrasted (or aided?) by his almost near whisper but all perfect diction.